Gain 1credit whenever the Runner makes a successful run. From all the currents in this game this one is my favorite and earned a sweet spot in my heart. First of all it comes at 0 cost, which is always awesome if you just want to remove the runners current. Let us focus on the real deal, this card is a powerhouse in terms of economy! Of course you won't play it in a no remote glacier deck. Fortunately there are many awesome assets and upgrades available. Obviously Gagarin Deep Space: Expanding the Horizon will benefit the most from this card. Have this on the board with Gagarisn ability and a Pop-up Window to "protect" your remote. Now you can place any asset or upgrade behind it and be done. The runner has to pay 1 for Gagarins ability, 1 for pop up while you get 2 back. One run will make 4 creds difference. Drop the pop-up for less important remotes. A simple PAD Campaign will cost the runner 5 to trahs while you gain 1. This card has a 2 influence cost, which is well deserved, with 1 influence it would be overpowered. While you can argue that influence is too valuable to spend 4 on 2 copies of paywall, some decks should reconsider this. A Near-Earth Hub: Broadcast Center or Jinteki: Replicating Perfection, or even an Haas-Bioroid: Engineering the Future could squeeze this in and profit from its constant income. Also Paywall can heavily discourage the runner from running on your assets. I had games when a single paywall gave me 10+ credits! This may be the best current in the game. Its reverse desperado. Most turns the runner will run at least once. Most runs will succeed. So, in general, this can be thought of as a 0 cost pad campaign that they can't trash, with the disadvantage that it stops firing if you are shutting the runner out. But its much better than that, because while it stopping when you are winning is a disadvantage, it ACCELERATES when you are getting creamed. Everyone knows how it feels to be a corp that's up against the wall. Someone siphons you and goes to town. Someone parasites all your ice and hems your money away. Basically somtimes you are on the ropes and they run you into the ground. The round after you get pummeled like that is always miserable because you need credits and you need cards to fix the situation. But with a paywall you'll have the credits. Their deep dive fixed your finances and now you can draw and play whatever to try and get out of the fix. Specific interactions: This card disarms hem, it means that they can't safely check your advanced cards when you are out of credits, because the 1 credit you get for the run will let you fire junebug or shattered remains. Finally, there's the added plus of being a current. Firing this turns off the runner current. Maybe that gives you back your hand size if you are facing a bad pub situation. Maybe it gives you back your Blue Sun powers. Weyland decks that run Beanstalk (0 money, 1 click for 3 creds) should replace it with this card. 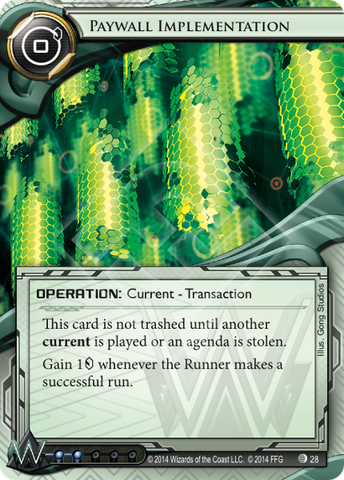 You can make the argument that Weyland decks that run Hedge Fund (1 click for 4 creds) should run this card. At the end of the day I think adding this card to a Weyland deck cannot hurt. Play this card.